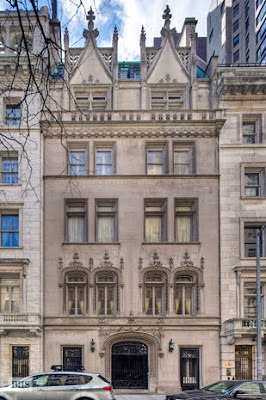 A New York City townhouse–owned by the estate of late lady-gym mogul Lucille Roberts (and shown above)–landed on the open market in mid-March 2011 to much real estate shock and awe with a titanic $90,000,000 asking price. The sick-palatial and approximately 18,000 square foot Neo-French Renaissance style pile–designed in 1911 (or so) by high-society architect C.P.H. 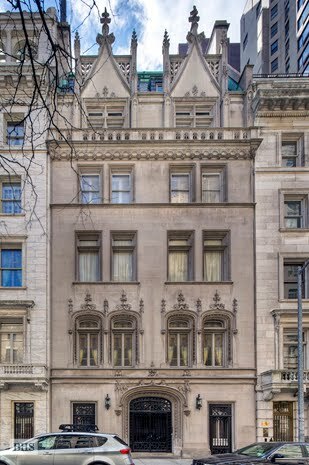 Gilbert for dime store tycoon Frank Woolworth for one of his three daughters–was concurrently listed for lease at an astronomical $210,000 per month. The fine folks at Curbed as well as many of the New York City real estate gossips reported today that the rental asking price for the 7-floor townhouse was recently slashed to a still spine tingling $165,000 per month. A few quick flicks of the well-worn beads on Your Mama's bejeweled abacus shows that at it's current price a rental tenant must bring in $1,980,000 per year just to pay the damn landlord their agreed upon due. We have no experience managing of residence of this magnitude but we imagine the deep pocketed tenant will have to cough up an additional couple or few hundred grand each year to heat, cool, clean and otherwise staff and maintain the high-maintenance mansion. Nothing like a little real estate reminder that you're poor as a church mouse, right? Jees, and I had managed to forget how poor I am, just for a minute. I generally think NY real estate is insanely overpriced, but I think I would actually pay the money for this. This would make the most fanatastic boutique hotel. And to think it was built from the profits of people like my paternal grandmother who loved saltwater taffy from Woolworths. (Good gods, no wonder I'm in therapy). I'm just hoping someone posts a floor plan somewhere! Whats the security deposit?? Any update on the Shafferman mansion on 5th avenue Momma? Second the motion on the floor plan!